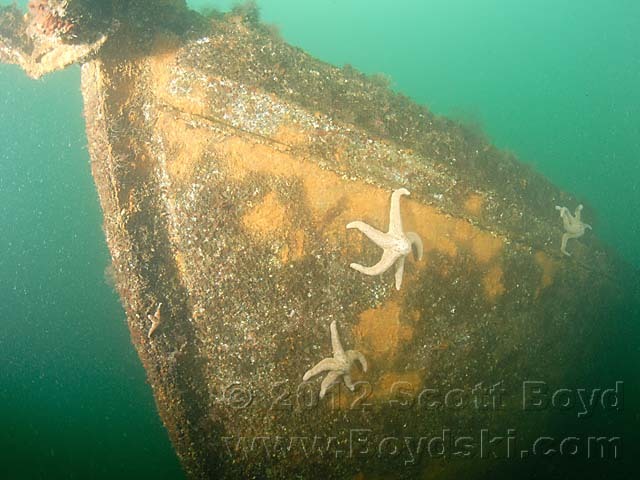 The Dreamscape is a very interesting shipwreck located near Bremerton in Washington State. The 130' long steel hulled fishing boat lies in fairly shallow waters, making this an easy and pleasant dive for new and veteran wreck divers alike. There is a large fiberglass, multi-level cabin in the middle of the vessel with large hatches forward, center and aft that give good access to the interior of hull. The interior of the vessel is mostly clear, which allows for fairly safe penetration, with several well lit exit points for those with good fin techniques. There are still a lot of wires and hydraulic hoses hanging in the interior which do present a snag hazard, so be careful. You can find a large bath tub, several air and fuel tanks and well as a few other artifacts in the interior of the wreck. At some point, this vessel was re-powered and re-purposed as a self propelled scow. The original shaft hole is huge and has been welded over. The original engine is also long gone and has been replaced with a smaller diesel engine that powers a small shaft that exits the hull to the port side of the original tail shaft. The rudder that has been placed to steer this large hull is a true marvel of backyard engineering. I can't imagine it being at all effective and I bet this craft was a hand full to maneuver after the re-fit. Just forward of the main engine (and attached by a belt-driven PTO) lies a smaller auxiliary diesel that probably ran the hydraulics and air compressor for this interesting wreck dive. Far forward is a very large deck winch and you'll also find large bilge keel stabilizers on either side of the hull. Rumor has it that this wreck was scuttled in 1992 or 1993. 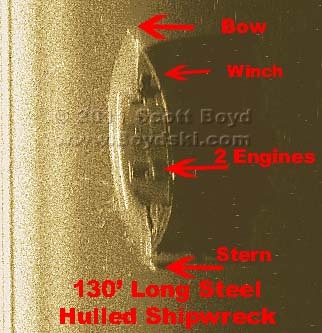 The wreck was then re-located by Scott Boyd and Richard Jack on 3 March 2012. Parker gave this wreck one Thumb Down, but I think his dive occurred during very poor visibility. 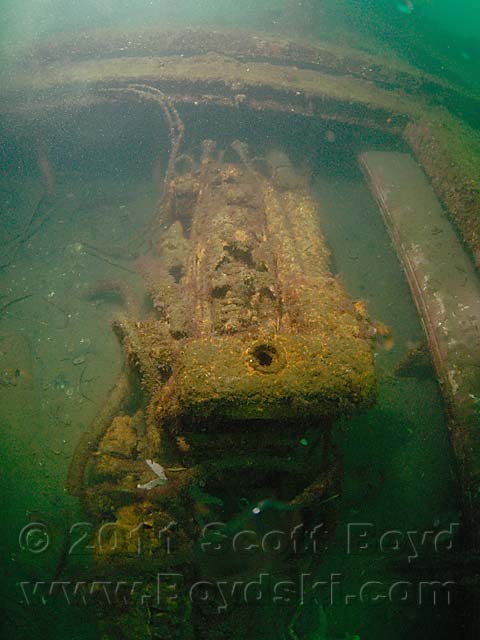 His comment was, "There is not much life on the wreck, but is kind of fun to crawl around in and on. " Location: Dyes Inlet, near Bremerton, WA. Depth: 35 - 45' Hazards: Boat traffic. 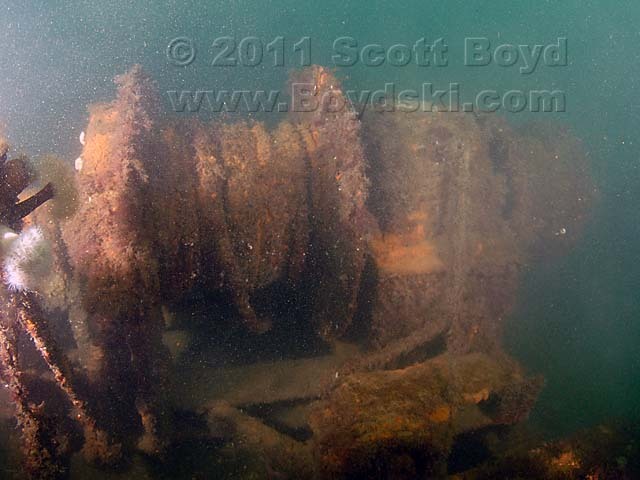 Photo of the Deck Winch on the Wreck of the Dreamscape. Re-powered Diesel Engine of the ShipWreck Dreamscape.